"Ash was unbelievably courteous and super nice. He is very knowledgeable and a best representative of the company. He is truly a..."
Ash was unbelievably courteous and super nice. He is very knowledgeable and a best representative of the company. He is truly a remarkable technician. Meet Ash one of our PolyLevel Foreman! Ash has many years of experience in the customer service industry. Prior to joining the Quality 1st team, Ash worked in disaster restoration for 2 years. He is a volunteer Firefighter and is HAZMAT certified. His day consists of meeting with our customers and helping them keep their properties safe by raising any sinking or settling concrete that could be a trip hazard. Ash knows the importance of a great experience and so he delivers WOW service to each homeowner he meets. When Ash isn’t out on the road meeting homeowners, he is usually shooting paintballs with his friends, working on cars, doing carpentry work or watching documentaries. 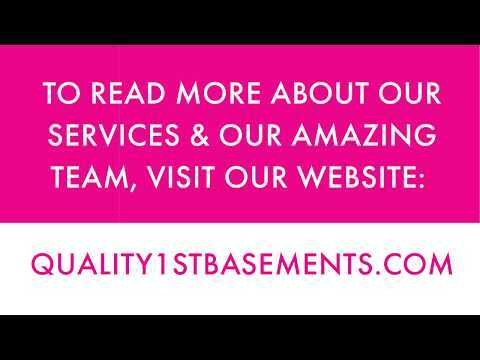 Quality 1st Basements Wins Best & Brightest in the Nation 2 Years in a Row! To ensure the safety of their patients and employees, The Deborah Heart & Lung Center in Browns Mills, NJ contacted Quality 1st in 2015 to remove tripping hazards caused from sinking concrete. The installation was completed and all trip hazards were removed with PolyLevel. The Deborah Heart & Lung Center was so satisfied with their initial PolyLevel experience that when they recently noticed sinking concrete in a different area of the Center, they contacted Quality 1st again. Just as our team did before, they came in and leveled the concrete, sealed the joints, and filled the holes. Now the center is completely safe for patients and employees. A sidewalk in the Brown Mills area of New Jersey had settled creating a small trip hazard. Quality 1st Basements drilled small holes into the sinking sidewalk. Using special equipment, Polyurethane foam known as PolyLevel is injected beneath the slab. The foam raises the concrete back towards its original position and then hardens to permanently stabilize it. Trip hazard was removed and the sidewalk could be used just 15 minutes after raised. Multiple pool slabs had settled causing trip hazards near the edge of the pool. When it rained water would get trapped and flood the pool patio area. Our PolyLevel Foreman, Ash G., raised the pool slabs back to level with help from Concrete Repair Specialist, Andy G.
Our Concrete Repair Team run by PolyLevel Foreman, Ash G., was able to lift and leveling sinking slabs near this pool area. The Swim and Sport Club was concerned the trip hazards that had formed from the settlement would cause an accident if someone were to fall. Ash and his crew, drilled small penny-size holes into each slab. Using special equipment, polyurethane foam known as PolyLevel is injected beneath the slab, raising it back towards desired level. The small holes are then covered with cement and within 15 minutes the slabs could be walked on or driven over! This installation is quick and easy causing no disruption to the surrounding areas. PolyLevel is waterproof and environmentally friendly making it a perfect solution for this area! A homeowner in Brick, New Jersey was experiencing dampness in their crawl space and contacted Quality 1st for a solution. Our System Design Specialist inspected the crawl space and recommended that the crawl space be encapsulated so no more water or cold air would enter the crawl space. A vapor barrier system, CleanSpace was installed on the crawl space walls and floors to make sure no water vapor or humidity passes through. This system also helps protect the homes structure against mold and rot. CleanSpace does not support the growth of mold or mildew and will keep the crawl space dry and healthy. A homeowner in Roxbury Township, New Jersey had water seeping in from the ground every time it rained. Quality 1st System Design Specialist inspected the basement and suggested it be waterproofed. WaterGuard was installed along the perimeter of the basement under the floor slab, on top of the foundation footing to prevent the system from clogging. Next, the TripleSafe sump pump was installed in the basement to pump the water out of the basement. The TripleSafe sump pump has three levels of pumps built inside in case of one pump failure, the next lower level pumps will kick in. The TripleSafe also comes with a backup battery that will pump 11,500 gallons of water or more on a fully charged battery. This basement is free from water and protected. We received a call from a homeowner who was experiencing a sinking concrete patio. Our Concrete Repair Specialist, Jeff P met with the homeowner, inspected the patio area, and measured roughly 6 inches of settlement. Jeff recommended our concrete lifting and leveling solution known as PolyLevel. Our PolyLevel team led by Ash, drilled small penny-size holes into the sinking concrete. Using special equipment, our Polyurethane foam known as PolyLevel is injected beneath the slab raising it back towards its original level. Our team then sealed the edges with NexusPro Joint Sealant to create a bond between the home and the patio.